The Syrian-Iranian-Russian alliance has achieved a large progress in its operations against ISIS in the province of Homs. On August 20, the Syrian Arab Army (SAA) liberated the key held village of Humaymah, which had been controlled by ISIS near the Iraqi border. The SAA allegedly lost a bulldozer and an unknown number of fighters during the clashes for the area. On August 21, government troops continued operations in order to seize the T2 pumping station that remained that last valuable ISIS strong point in this part of the administrative border between the provinces of Homs and Deir Ezzor. On August 20, the SAA Tiger Forces, backed up by Russian attack helicopters, liberated from ISIS the village of Taybah and the Maqbarah Mountain located at the Resafa-Sukhna road posing a real threat of creating the second ISIS pocket in the province. On August 19, pro-government sources reported that warplanes of the US-led coalition bombed the Tiger Forces in Kadir north of Taybah. No videos or photos from the area appeared. However, even the airstrikes took place they didn’t prevent government forces from further advances against ISIS. Pro-government experts believe that the SAA and its allies will be able to clear the entire area north of the Homs-Palmyra highway from ISIS within a month. The Russian Aerospace Forces have destroyed a large ISIS military column heading to the area of the city of Deir Ezzor “to regroup and equip their last base in Syria”, the Russian Defense Ministry said. Over 200 ISIS members were reportedly killed and about 20 vehicles equipped with large-caliber weapons were destroyed. 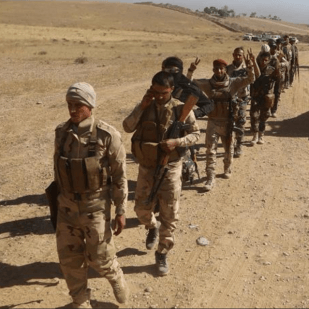 On August 20, the Iraqi Army, Federal Police, SWAT forces and the Popular Mobilization Units (PMU) launched a large-scale operation to liberate the ISIS-held Tal Afar area in northern Iraq. The Iraqi military had deployed 40,000 fighters for the operation. According to the Pentagon, ISIS has about 2,500 members in and around Tal Afar. By August 21, Iraqi forces have achieved notable progress in the town’s countryside liberating over 12 villages and facing little ISIS resistance. The main fighting will likely take place inside Tal Afar itself.